Germany Together with 190 Other UN Member States, Have No Intention of Attacking Syria. Why Has Britain? Does the Conservative government of Theresa May imagine that Britain, in 2018, with just one tenth the armed forces of America, is still a global military power? Does it imagine that the UK has millions to throwaway on a military adventure when our National Health Service is on the point of collapse through lack of funding? When the sick lie on trolleys in hospital through lack of beds? Where our cancer treatment record is still the worst in Europe? Where our roads are so full of potholes that we are more like a banana republic? Where the government has cut welfare payments for the sick and disabled? Where crime and murder in our cities is rising due to cuts in police numbers? Where knife attacks in London are at a record high? Where public spending is at an all-time low due to massive government debt? Yet this Prime Minister, with no military experience whatsoever is prepared to commit the United Kingdom to war? The electorate would not sanction it and neither must Parliament. Britain has just one (1) outdated, Trident submarine at sea at any one time. Israel has a fleet of four (4) state-of-the-art, German built, Dolphin Class, nuclear-armed submarines with cruise missiles currently assumed active in the Mediterranean and the Gulf. It is clear that the British Prime Minister is under the covert influence of a political lobby that acts not in British interests but of those whose agenda is to effect regime change, not in Syria but in Iran. And that puts the UK on a collision course with both the European Union and the UN Security Council. 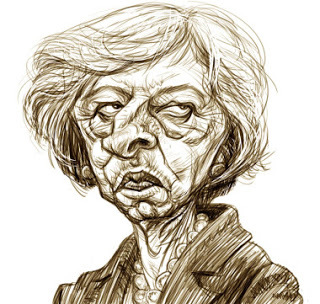 Theresa May must not be allowed to take military action against Syria upon the request of the erratic Trump administration or under pressure from the unelected CFI Lobby or any other political pressure group. The consequences could prove disastrous for Britain, and for Europe. Hans Stehling (pen name) is an analyst from the UK; a frequent contributor to Global Research.